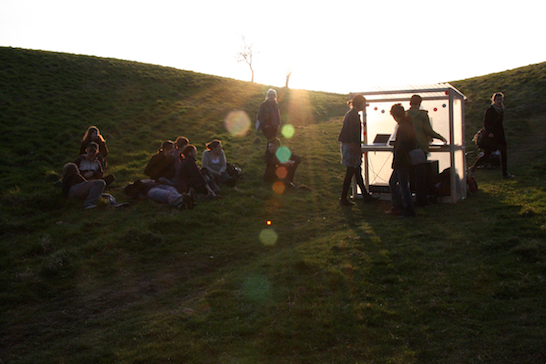 Happening and soundstation outpost in a valley enclave, Phoenix Park, Dublin. Wooden construction with rainbow lights, corrugated plastic roofing, sheet plastic, L.E.D. strip lighting & sound equipment powered by a generator. For the event, people were invited to bring music to play at dusk in the park. The site and the time of day chosen created an environment for the work that had an edge of threat; with dusk as a liminal time between daylight and nightfall. At night, this immense city park is swallowed by darkness and becomes, until daylight, a dark unimaginable hole in the city. This site met with the desire for agency and for beginning something new. This nascent desire was contested by the liminal site of the work.